Our Wildlife in the West students recently went fishing at Upsata Lake, but they didn’t want to catch anything, except maybe some plankton, aquatic insects, or algae. Motored gently about in small skiff by volunteer Barry Gordon, and led by Blackfoot Challenge’s Caitlin Mitchell, we hand-reeled in a white, three-foot net on a hundred-foot rope. Shaped like a wizard’s hat, our net yielded just a little draft of fluid the color of weak green tea, which we promptly conveyed into a 250 mL plastic bottle. There were some crumbles and scum in the fluid, some of which squirmed. Combine a pinch of anxiety, duty, and attention to the dictates of protocol – plus equal parts of curiosity, comradery, and joy to be out near a beaver lodge and a loon – and you have the basic recipe for starting a new season of AIS monitoring. 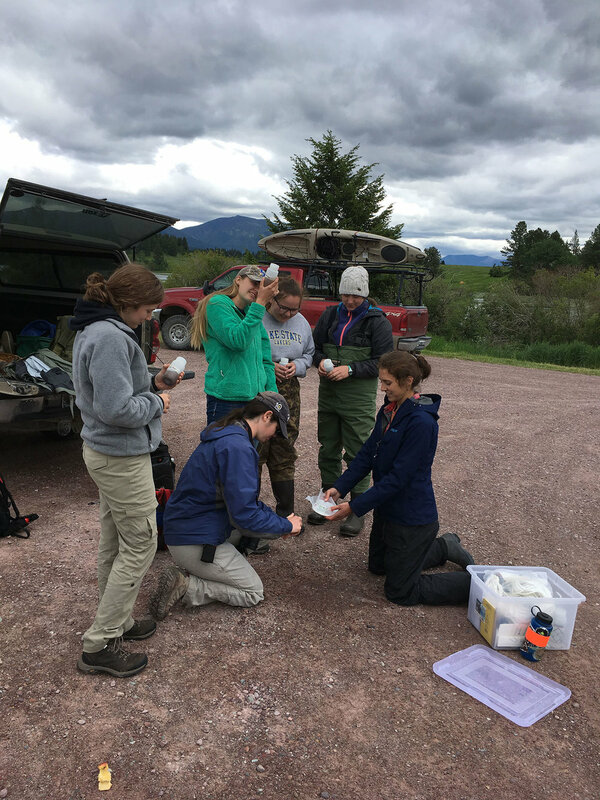 For the second straight year, SVC has joined forces with Blackfoot Challenge, Clearwater Resource Council, and the Missoula County Weed District to monitor our lakes for veligers, the free-swimming, microscopic larvae of zebra and quagga mussels. These insidious invertebrates seem to exist without consequence in their home ecosystems of southern Russian and Ukraine, but on this continent, they are the bane of all things aquatic. They’ll monopolize the freshwater floors, crowding out native plants and cutting swimmers’ feet. They’ll colonize docks and boat ramps and watercrafts from supertankers to standup paddleboards. If any landlubbers feel that’s not cause for concern, they’ll clog pipes that help us all drink, flush, and irrigate crops. And in our region, where a hose and drop bucket are tools of the firefighter’s trade – well, you guessed it – they’ll clog those too. 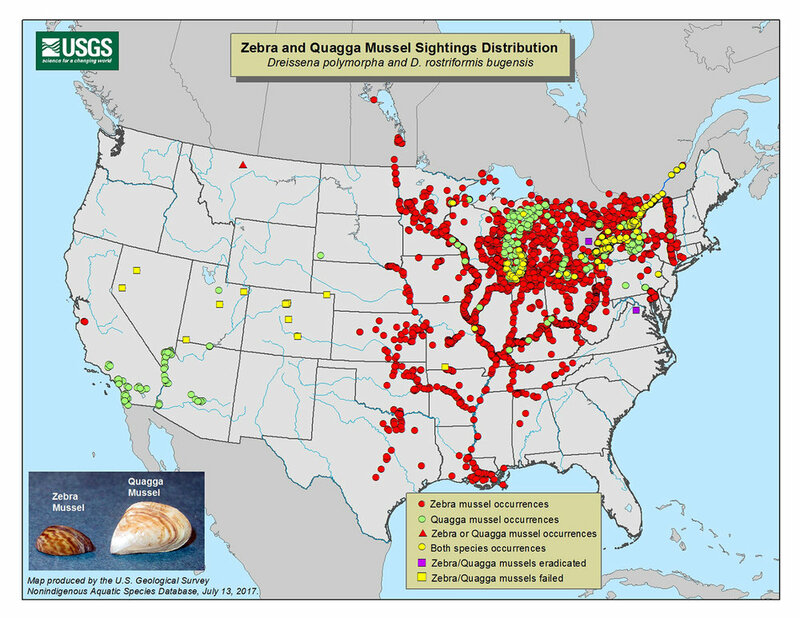 This map shows the nationwide extent of zebra and quagga mussels, as of July 2017. Two “suspect” veliger samples were found in Montana’s Tiber and Ferry Canyon Reservoirs in 2016, and though intensive surveys – including divers, water drawdowns, and dogs – have not confirmed mussels, preventative measures continue. It’s not that zebra and quagga mussels are evil. They just don’t belong here. Our native mussels have put in the time – many, many millennia – to adapt to this place. Instead of free-swimming veliger larvae, our natives have even evolved a larval form called glochidia, which can live within the gills of fish. Let me repeat that: they can live within the gills of fish. In this amazing commensal relationship, the glochidia can live in oxygen-rich apartments without hurting their host, which thereby grants them a free ride to new habitats. In one particularly endearing alliance, the western pearlshell has evolved to disperse within Montana’s state fish, the westslope cutthroat trout. And unlike the zebra and quagga, our native mussels do not cling to hard substrates when mature, but instead coexist peacefully half-buried in mud or sand. As some of the longest-lived animals on earth (~100 years), western pearlshells have a perspective worth conserving that the zebra and quagga newcomers do not. The pearlshells’ perspective is what we’re after too. 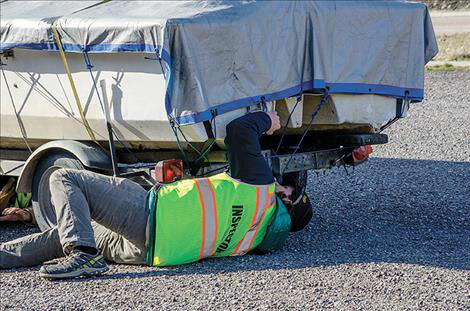 The Swan, Blackfoot, and Clearwater watersheds are entirely free of invasive mussels, and our work is all about taking the proactive, preventative steps to keep them that way. With funding through Montana’s Department of Natural Resource and Conservation, our samples are sent to Montana Fish, Wildlife, & Parks, where they undergo rigorous microscopic analysis. For extra precaution, separate funding from the US Forest Service also allows us to scan samples with the newest eDNA technologies, which can even detect sloughed off veliger cells in the water. Three times this summer, SVC will be sampling four lakes – Van, Holland, Lindbergh, and Swan. In the unfortunate instance that we’d catch some of these most unwanted mussels, we’d then be able to help enact quarantines and other treatments to ensure the invaders don’t settle in. Our students from Wildlife in the West, each of whom hail from some large mussel-infested lake in the East, know the havoc that zebras and quaggas create. If it’s not frightening enough to imagine these mussels upturning our native ecosystems (and all the irrigation and hydropower infrastructure of the Columbia River Basin), our students’ surprise that we don’t have any at all in western Montana was the best reminder as we’ll get: don’t take this for granted. Caitlin (a former SVC-program alum herself) provided sole leadership in a temporary AIS position across the Swan, Blackfoot, and Clearwater last year, and our students found her to be an empowering guide. I did too, and since Caitlin’s skills earned her a permanent role with Blackfoot Challenge, I will be conducting our partnership’s surveys in the Swan watershed this year.  In the coming months, I invite you to join as I share more about the people, ecology, and methods involved with our project. Please contact me if you ever need more information, want to arrange a presentation, or would like to help as a volunteer (754-3137; rob@svconnections.org). I’ll be giving my next AIS presentation for our first Holland Lake campfire talk, in the day use area on Friday, July 6 at 8 pm.